I'm very new to Linux and CQRLOG. I was having no luck getting the PC to key my rig on CW. Now I've got it working. Here's what I did to key my FT-1000D. I kept seeing references to cwdaemon, but had absolutely no idea what it was used for, so I decided to investigate. cwdaemon is a utility program that allows the PC to key the rig using either the parallel or serial port. In my case, I key from the parallel port. Years ago, I built a small transistor switch interface (right out of the CT and later, N1MM logging program's instructions) and use that to key the radio. It's worked flawlessly for years in the Windoze world, but no luck with Linux and CQRLOG, or so I thought. I searched (Linux Mint 17.2) ADMINISTRATION, SOFTWARE MANAGER and typed in: cwdaemon and hit the search button. There is only one result returned and that's cwdaemon. I installed it and made NO changes to any of the default settings in CQRLOG's, Preferences, CW interface, cwdaemon settings. That did it! My normal keying speed during any CW contest is between 25 and 35WPM. The program is sending perfect CW with no Winkeyer or K3NG Key. Just straight out of the PC and into the key switch interface and right to the key jack on the rig. I know CQRLOG is not a contesting program, but at least I've got it working and it's completely usable. My previous post showed everything to working fine, but I made a few changes and now it's not anymore. Last week, I wiped my 2 year old linux mint 17.3 (updated from 17.2) machine clean and did a fresh install of linux mint 19.1 I was able to get everything working without issue, but no matter what, I CANNOT get cw to key the rig anymore. I already installed cwdaemon from the software manager. Same machine and hardware and same radio as before. Only difference if the version of LM and CQRlog (was 2.1 - now 2.3). I have been using the same generic serial/parallel adapter board in my PC. I key from the parallel port. It worked before, but not anymore. I'm already a member of the dialout group already and the machine report the existince of the adapter board. Any thoughts? - I'm stumped and don't what else to try. Also, my settings have not changed from before. Maybe the kernel has changed so much that cwdaemon does not work any more. Have you tried to compile it from source with present LM ? Anyway cwdaemon is not good. I have never succeeded with that. Those times I have tried it (years ago) the speed was varying all the time. Could FT-1000 send cw using cat commands? You can try to set keyer as hamlib in preferences. It may have some delay problems, at leas I feel so with IC-7300 cat based cw. Start takes some milliseconds that may be annoying with high wpm qsos. Best solution how ever is and arduino microcontroller based K3NG keyer with winkey emulation. It starts faster than cat cw. It kills me to think I need a cw keyer with emulation software, when I have a perfectly good, working, homebrew cw keyer that I've used for many, many years. I don't get it why, cwdaemon worked under LM17 and not under LM 19? As said I have never succeeded with cwdaemon. If some other user can give better advise with that please do so. your keyer: Does it support connecting to computer or is it just a stand alone one? FT-1000D: hamlib keying support. Just seleect keyer hamlib at preferences and reload cw interface from NewQSO/Reload CW interface and try to send a cw macro or use CWType. Does it work? K3NG: Quite simple solution that really works. As said LM 17 and 19 have different kernels that may effect to accessing ports (parallel and serial) I may be that kernel needs to be recompled with different options, or some module loading. LM is unknown for me, so I can not say any better details. Hi Bob! I had such a problem with LM 19.1 (64-bit) and cwdaemon. Solved the problem like this: downloaded the package from here https://debian.pkgs.org/10/debian-main-amd64/cwdaemon_0.10.2-2_amd64.deb... and installed it via GDebi. And it works! Sorry for my english. I solved the problem once and for all. I purchased an Arduino based CW keying interface that emulates a WinKeyer. I purchased a Mortty kit from, hamprojects.info. Steve N8AR and Larry K8UT developed the very simple kit and are selling it for $18 USD plus shipping. The kit can easily be reprogrammed with a different sketch. they even provide a YouTube link that shows EVERY step required (even for a noob like me) hi. It took me about an hour to build and the directions are very clear, including color photos of each step. The Arduino arrives already programmed with the proper (CW only) sketch installed. There are three different sketches available. See web site for details of each. 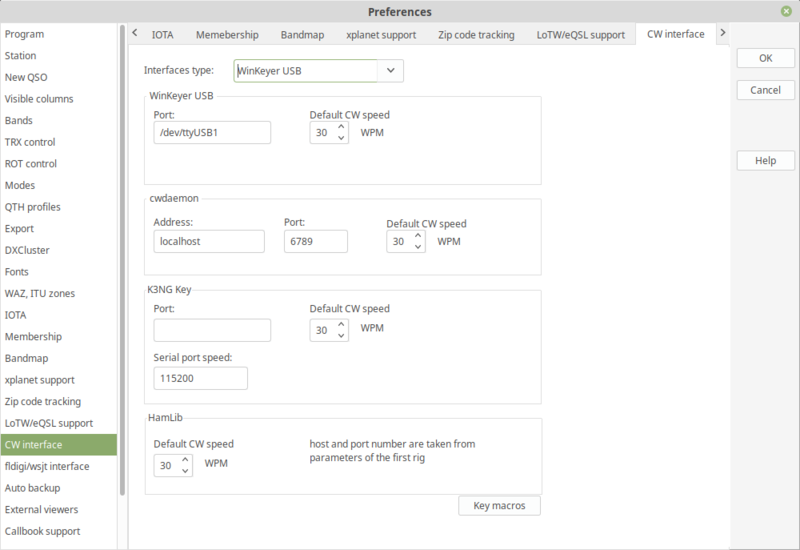 After assembly, I started up CQRLog and set the keying interface for Winkeyer USB. I had to experiment with trying different USB device numbers, but finally ended up with USB1. This actually does work better than when I was using cwdaemon on Linux Mint 17.3. I can now immediately kill the message being transmitted, by hitting the ESC key on my keyboard. Using cwdaemon, there was a significant delay between hitting the ESC key, and actually having the CW message stopping. CW sounds perfect even at my contest speed of 30-36WPM. I also tested the Mortty device on my Windoze-7 partition, to run N1MM logging software for contests, and it also worked perfectly. I still am irked by the fact that I needed to get something additionally to key my radio, when using cwdaemon under LM 17.3 and coming out of the parallel port on the PC would transmit without any problem. There is a write-up in this months issue of QST magazine detailing the device. It worked correctly, the first time I powered it up. Here's the link to Mortty. Finally... CW once again from CQRLog at my station. TNX for everyone's assistance - I really do appreciate it. Yes, this key interface worked the first time I connected it to my PC's USB port. Just set your logging program us use the WinKeyer interface, and that's all you need to do. Pay attention to which virtual port your Windows machine assigns and set it in the logging program. There is one thing to look out for... some versions of Windows will need to download a special piece of driver software (from China manufacturer) for the USB chip on the generic Arduino micro-board. Building instructions on the Mortty website clearly show how to do this and I believe the video also shows what to do. I believe the main chip on the Arduino board is an emulation of a true USB interface chip, and some installs of Windows do not have this driver preinstalled. Mine actually already had the driver. You'll know if you need the driver within just a few moments of plugging the Mortty device into your machine's USB port. If the machine makes the usual Windows "ding" sound when plugging in a standard USB device - then you are ready to go. No additional software to download. This device has worked great so far for my Linux Mint 19.1 partition and my Win-7 partition (N1MM logger) on the same machine.